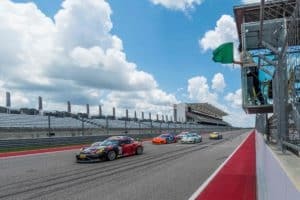 AUSTIN, Texas – After Saturday’s Pirelli Trophy West USA race action that included heavy rains, Sunday featured a day of sunshine to cap a fantastic weekend of racing at the Circuit of the Americas. Despite the different conditions, it was a similar roster of runners who raced to the front on Sunday as the teams and drivers relished the weekend at the Formula 1-grade facility. Doubling up on their weekend of wins were Kevin Woods (Diamond), Preston Calvert (Diamond Masters), Laura Ely (Bronze) and Mike Vess (Silver) as they swept the weekend. Sean McAlister turned his Saturday frustration into a Platinum class win on Sunday to score one win on the weekend. With twenty-nine Porsche GT3 and GT4 Cup cars competing in five different classes, it was an active day of racing on the 3.427-mile, 20-turn course at Circuit of the Americas: Diamond and Diamond Masters (2017-2018 991.2 GT3 Cup), Platinum (2015-16 991.1 GT3 Cup), Gold (2010-2013 997.2 GT3 Cup), Silver (Cayman Clubsport GT4 MR) and Bronze (2016 Cayman Clubsport GT4 Trophy) classes. 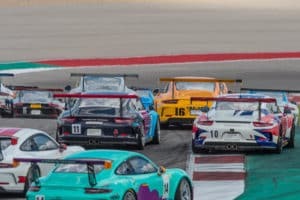 Woods’ TruSpeed AutoSport Porsche was forced into an honest pace by Jonah Yokubaitis, but pulled away from pole position and led all 15 laps of the race to win by 3.510-seconds. Woods also turned the race’s fast lap on the way to his eighth win of the season. 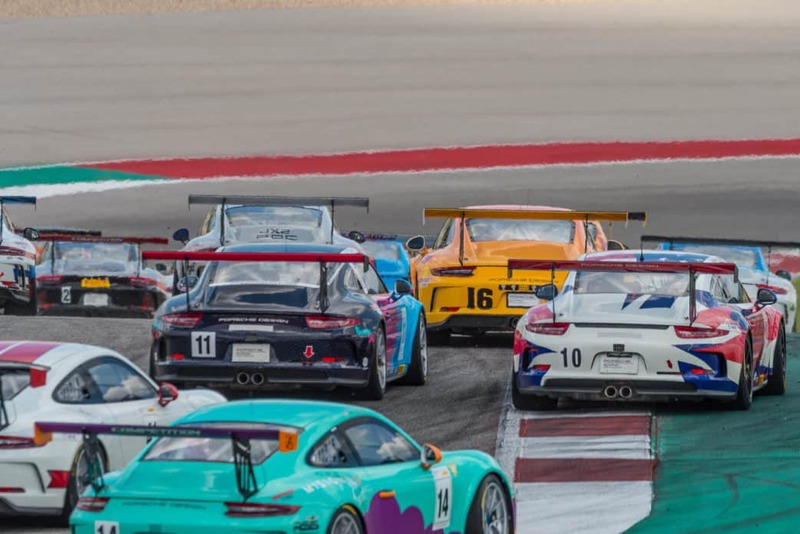 Calvert started second in his Diamond Masters-class Competition Motorsports Porsche and fell just off the pace that was set by Woods and Yokubaitis. Instead, the three-time race winner battled with the Diamond class’ Tom Haacker after shaking free of teammate and class rival Michael Zuieback early in the race. McAlister’s Competition Motorsports machine picked up the battle with Zuieback for fifth and sixth overall, claiming the top five overall finish with a last lap pass. The win was a redemption of sorts for McAlister, who spun in a similar situation on Saturday and fell to the bottom of the results. The GT4 overall and Silver class win went to Vess, who may not have had the raw pace of Ely in the Bronze class but stayed consistent to the checkered flag. That allowed him to get by Ely’s Black Sheep Racing on lap 11, when Ely – who by her own admission had struggled with the corner all weekend – spun on her own in Turn 19. Vess went from challenger to all alone in his NOLAsport Porsche Cayman to take the win after starting second. Ely was still in control of the Bronze race, even after the first spin, but a repeat incident on lap 13 pushed her back to Race Technik’s Paul Nemschoff. Ely rejoined just in front of the charging Nemschoff, and then outlasted him to the finish for the win. Overall, the weekend was deemed a tremendous success by Competent Motorsport President Greg Franz. Franz also added a surprise announcement as the series looks forward to 2019. “This weekend exceeded our expectations,” Franz said. “Not because of the track, which is the best in the United States, or our drivers, but because of the other things we were concerned about like the weather. Everywhere we go, people tell us that the Pirelli Trophy West USA brings the best weather! 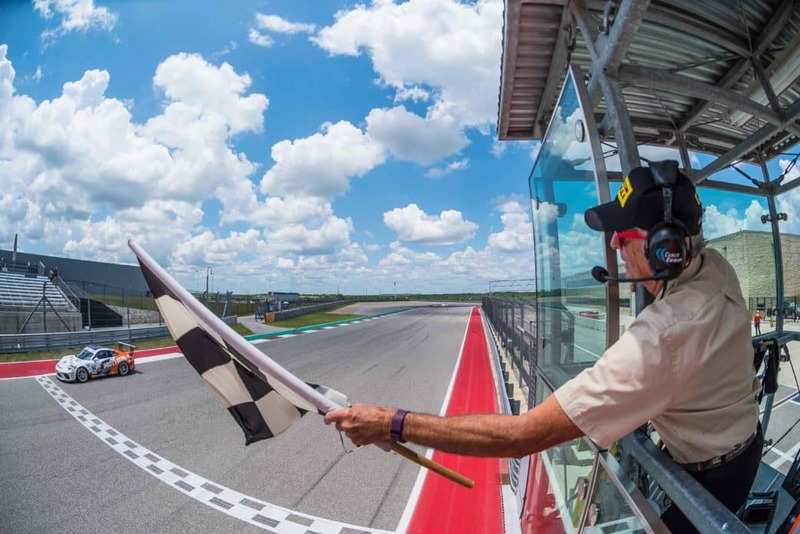 Next up for the Pirelli Trophy West USA will be two races at WeatherTech Raceway Laguna Seca, September 6-9, alongside the IMSA WeatherTech SportsCar Championship. Live timing and scoring can be followed at http://www.competentmotorsport.com/index.php/live-timing/. This entry was posted in News on July 9, 2018 by admin.